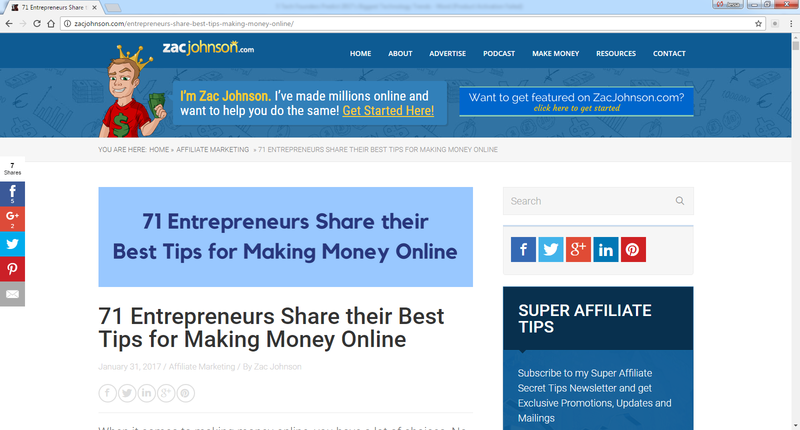 Want to find out the best way to make money online—how about 71 hot tips? Zac Johnson’s blog recently featured a bevy of advice for those looking to get a little flusher this year, and I was happy to contribute. One of my favorite ways to make money is via content writing and luring leads to my main company (Due.com) in the process. I’ve had experience writing for some of the biggest media outlets and platforms in the world, and my content has been read by thousands. That’s a serious introduction to the world of content creation! Content is king, and it’s paramount for getting your brand in the limelight. Of course monetization is the eventual goal, but focusing on content has been critical in getting to that point. Additional tips I like are affiliate marketing strategies and opting for online consulting. They’re very different approaches, but if you like them they offer some much-needed variety. Creating a digital product or service is another smart move, and white papers can go for a pretty penny (or be used as swag). With so many ways to make money online, why aren’t you?